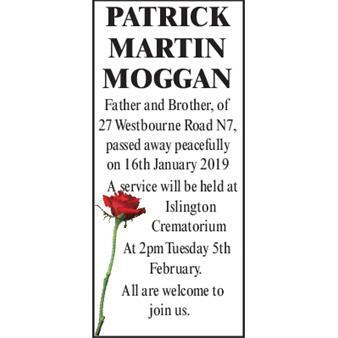 Originally printed on January 31, 2019 in the Islington Gazette. 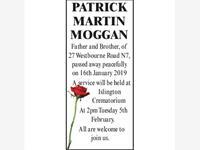 PATRICK MARTIN MOGGAN Father and Brother. of Westbourne Road N7. Passed away peacefully on 16th January 2019. A service will be held at Islington Crematorium At 2pm Tuesday 5th February. All welcome.